I'm sure many of you have heard of the high street cosmetics brand Me Me Me over the last while, especially since the Pixiwoo sisters have started featuring their products in their videos. Unfortunately, Me Me Me Cosmetics wasn't available in Ireland up until recently; it's currently only available throughout Munster, but will be sold throughout the country and online in the coming months. I was sent out a few products to try out, and I'm genuinely SO impressed! A lot of Me Me Me's products are fantastic dupes for Benefit products in particular; especially the highlighters and blushers. Blush Me! blusher in 'Rouge' (£7.50): This gorgeous blusher is a fantastic cheaper version of a Benefit blusher; similar in packaging and size. 'Rouge' is a deep-coral/ red shade, sheer but easy to build up. It's a fantastic shade to add life to a pasty face in the morning. It lasts all day and the included brush makes it handy to pop into your bag for travelling. 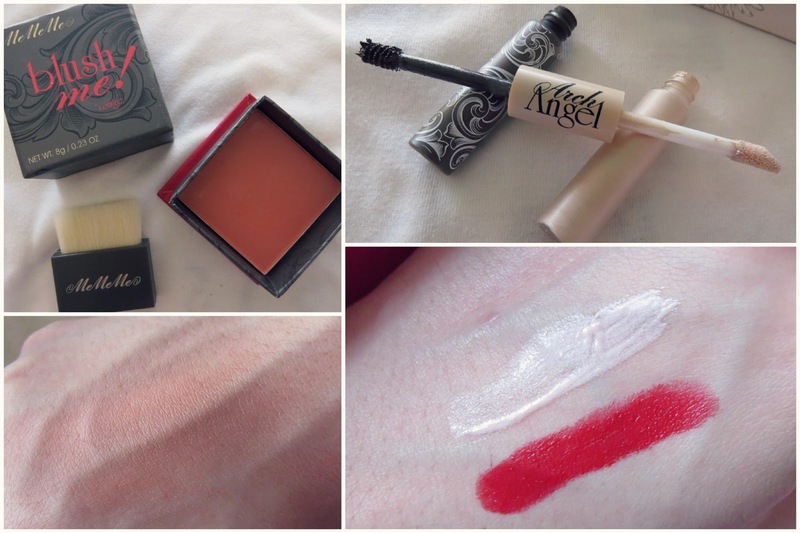 Arch Angel (£6.50): My favourite product from Me Me Me Cosmetics by far, is the Arch Angel double-ended wand for eyebrows. One side is a brown brow gel, the other a pearlescent cream highlighter. The brow gel is exceptional; the formulation is non-gloopy and easy to build up. The gel defines the brow hairs beautifully, and keeps them in place throughout the day. It also doesn't run in the rain, which has been a huge problem for me in the past with coloured brow gels! The cream highlighter is fantastic to apply under the brow bone for an instant lift - it also looks amazing applied on to the inner corners of the eyes and on the upper cheekbones. For the price it is, this product is absolutely incredible. I'll definitely be repurchasing! Long Wear Satin Lip Cream in 'Ruby Rich' (£8.50): I've been wearing this lipstick non-stop since receiving it; it's pigmented, moisturising and smells delish! The only downfall is that it doesn't last too long on the lips and wearing lipliner underneath is a must. It's a perfect 1950's classic red - instantly making your teeth look whiter and your complexion brighter. Beat The Blues highlighter in 'Pearl Pink' (£5.50): Beat The Blues is an almost identical dupe for Benefit's 'High Beam' liquid highlighter; it's a pearlescent pink, ideal for those with paler skintones. I usually use liquid highlighters on the tops of my cheekbones, brow arch and the inner corners of my eyes, prior to applying to face powder (always use a cream product on top of a cream). It stays put all day and is easy to blend and build up. It's brilliant to use mixed in with your foundation also, for an extra healthy glow to the face! Edit - I recall seeing some Me Me Me Cosmetics on sale before in New Look, Jervis - so keep an eye out in that store. Also, some readers have informed me that you can buy the products in Superdrug, The Square, Tallaght. If you know of any other stockists in Ireland, let me know! Have you used Me Me Me Cosmetics before?